Clay Cane is a New York City-based writer who is recognized for his contributions in journalism. Clay is a regular contributor for various print and online publications such as The Advocate and BET.com. He is the author of the highly anticipated novel Ball-Shaped World, which is a fictionalized account of the black and Latino ballroom scene. Also, he is the Entertainment Editor at BET.com and a member of New York Film Critics Online. He can be reached at claycane@gmail.com. Did Kathy Griffin bomb at the Apollo? Lil' Kim on plastic surgery -- CLICK! No more Chris and Rihanna! Bobby Blake: "I don't believe in gay marriage." This weblog is licensed under a Creative Commons Attribution-Noncommercial-Share Alike 3.0 United States License. 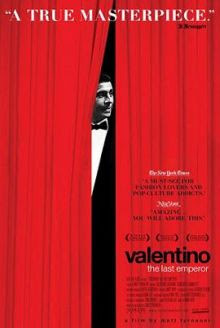 I've already been to more screenings I can count this year, but Valentino: The Last Emperor is the first must see movie of 2009. Mind you, I am not a fashionista and have lil' to no interest in the high-fashion world. Nonetheless, this documentary on Valentino was inspiring to watch and transcended the limitations of fashion -- plus, there is his partner of over 45 years. And people say gay relationships can't work! The movie opens in New York City today. Check out the review for BET.com.